Genoese meat ravioli, back to the origins. There are those who defined the Genoese meat ravioli as “the most exquisite of all the soups in the world” (Giovanni Casaccia, Genovese-Italian Dictionary, Genoa 1851). Someone like Ratto, author of one of the first cookbooks on Ligurian cuisine (“La vera cuciniera Genovese”, Genoa 1863) claims that ravioli were invented by a Genoese cook and then spread all over the world: “This is the queen of all the soups of the world, invented by a Genoese chef, and now generalized everywhere for the excellence of its taste“. Actually, soft shells of fresh pasta containing a filling were found in ancient cookbooks throughout Italy and history teaches that similar dishes existed in the Babylonian, Egyptian, Greek and Roman cuisine. After all, even in China there are steamed ravioli. But what is certain is that in Genoa, as well as in the whole hinterland of Liguria, the art of stuffed pasta has developed precociously compared to the rest of Europe. It became then, with the centuries, a sophisticated art based on the balance of multiple ingredients – vegetables, meat, cheese, spices and aromatic herbs – skilfully selected and dosed. There would be notarial documents attesting the production of ravioli in Liguria even as early as the end of 1100: in a contract of the end of the millennium, in fact, a farmer from Savona would undertake to provide the owner during the grape harvest a meal for three made of bread, wine, meat and, in fact, ravioli. The name “ravioli” would have different origins. 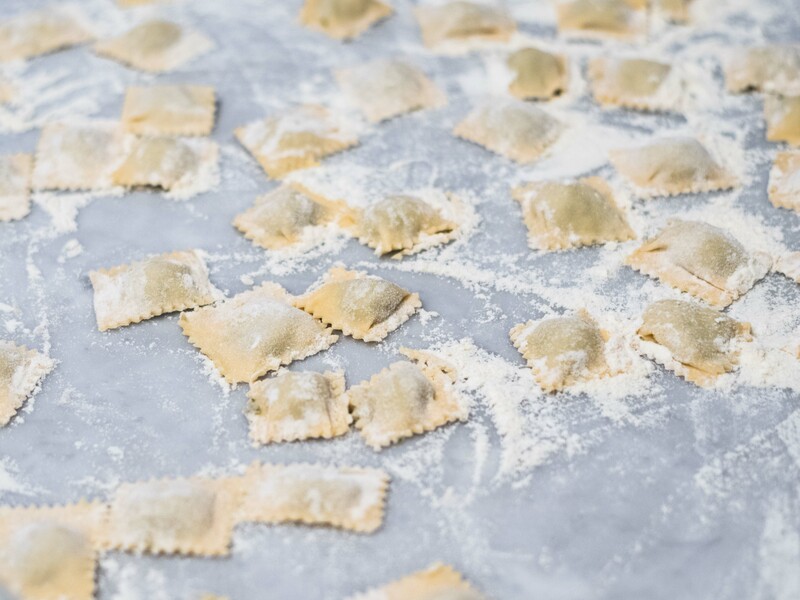 According to some, ravioli were invented in Gavi Ligure, when this country-stronghold belonged to the “Republic of Genoa”, and its first chef would have been someone named”Ravioli”, surname of families still resident in the area. 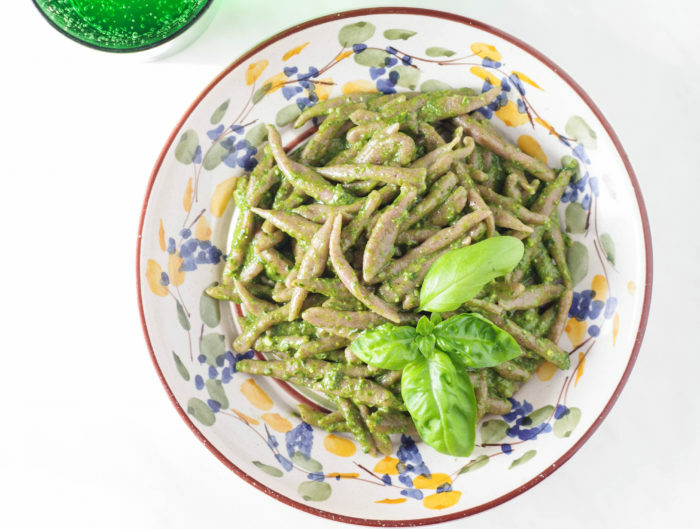 Popular legend that clashes with the real spread of filled pasta throughout Italy. Another legend instead, tells of a poor woman who wanted to sanctify Christmas with a meal worthy of such an occasion. 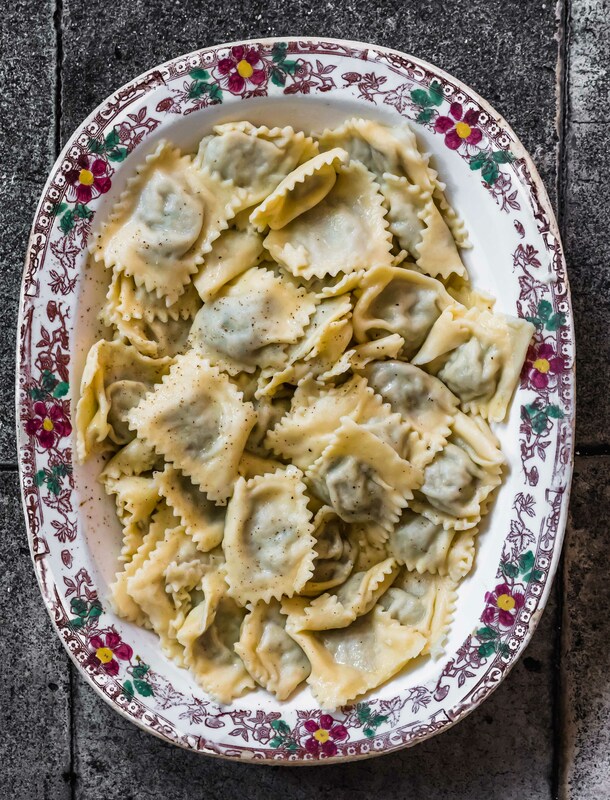 Its scarce riches however allowed her only to fill squares of pasta with vegetables, leftover meat and much raviggiolo, a cheese said so because it pinched like radishes (ravanelli in Italian), and hence the word raviggioli, then became ravioli. This legend, with its weaknesses, however, contains a kernel of truth, because ravioli, although a refined gastronomic product, has a popular origin also linked to the art of recycling leftovers. 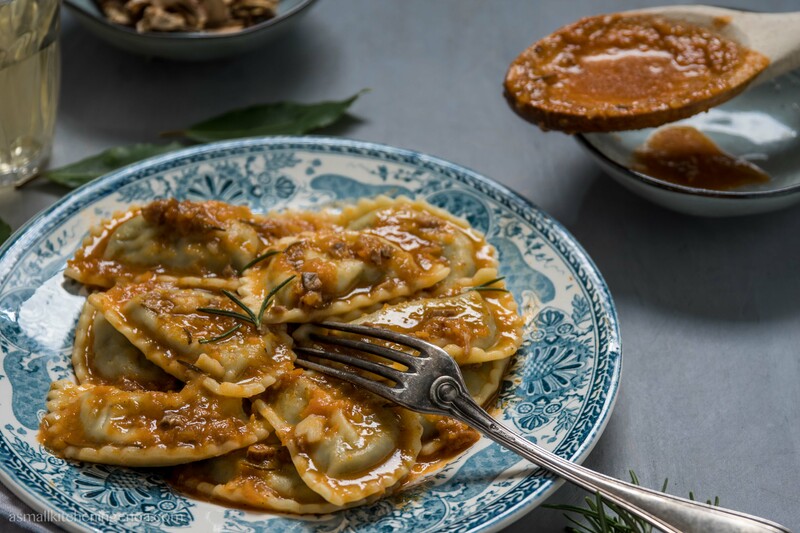 It is also interesting to know that in the oldest Italian cookbooks for “raviolo” it was intended only the stuffing, while the shell of pasta then stuffed was called “tortello“. Even Peregrino Artusi (one of the most famous Italian cook of all time) introducing the “Genoese ravioli” in his masterpiece “La scienza in cucina” comments: “These really should not be called ravioli, because the real ravioli are not made of meat and do not wrap themselves in the dough“. However, in Genoa ravioli, u ravieu in dialect, as we know them nowadays, are a main traditional dish. They are reserved a place of honour in the menus of inland restaurants with checkered tablecloths. They appear, unfailingly, on the tables of Genoese families on feast days and for special celebrations. Genoese meat ravioli have the classic square shape with scalloped edges. The filling is a mixture of meat – veal and pork (the original recipes also include some offal)- and vegetables – tradition wants escarole and borages – all tied together by parmesan cheese, eggs and marjoram leaves. Their main sauce is meat sauce, u tocco in dialect, a velvety sauce obtained from the long long cooking (ab 5 hours) of a big piece of meat (I still have to publish the recipe, will do soon!). You can find them also seasoned with mushroom sauce. But in reality they are also excellent served just with butter, a sprinkling of parmesan cheese, some sage leaves and perhaps a scratch of black pepper. In this way it is possible, in fact, to concentrate on the delicate flavors of both the filling and the fresh pasta that contains it. They are definitely my favorites. 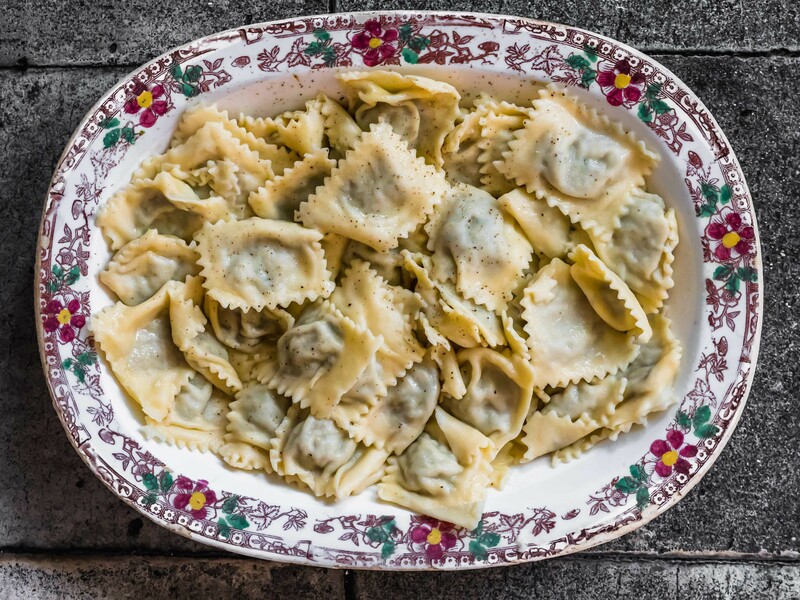 When I was a child my grandmother’s Genoese meat ravioli arrived at the table always in double version, with meat sauce, in a nice serving porcelain dish, and “in white” in a modest kitchen dish. For some reason, however, the “poor” dish was emptied in no time, while those seasoned with the meat sauce had to wait for the second round to leave the scene. Perhaps was it my fault? Sift the plain flour with the semolina flour, place it on a wooden flat surface and make a well in the middle. and it doesn’t stick to your fingers anymore. Let it rest for about 30 minutes at room temperature wrapped in a plastic film. Clean the veggies and boil them in slightly salted water for 5 minutes. Drain, squeeze very well and chop finely. Soak the breadcrumbs in the meat stock for 2 minutes, then drain, squeeze and chop finely. Finely cut an onion and sautè at low heat in a skillet with 2 tablespoons of olive oil and the pine nuts. When the onion is golden add the meats cut in small pieces and sauté until cooked and brown. Remove from the pan, drain the juice if any and mince finely in the blender. In a bowl mix minced meat, veggies, breadcrumbs, eggs, parmesan cheese, marjoram. Season to taste with salt, pepper and (few) nutmeg. Make a paper thin wide sheet of pasta and lay it on a floured wooden board. Roll the dough from time to time when you fill it in order to avoid it gets dried. Put little mounds of filling – about one teaspoon each - at regular intervals onto the sheet of pasta. Fold the pasta to cover the filling and press gently with your fingers all around the filling, to seal it. 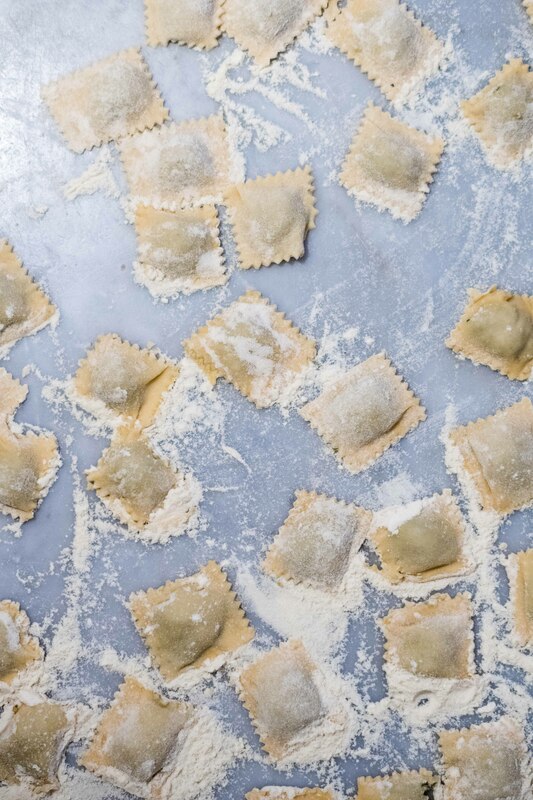 With a scalloped pastry cutter cut the ravioli and put them onto a floured tray in one layer. Cook the ravioli in batches, according to the size of the pot, for 6-8 minutes. Drain the ravioli and toss them in the serving plate with two nuts of butter, some leaves of sage and a couple of spoons of parmesan cheese, or season with meat source or mushroom sauce. This is the season of Chinotti, a special bitter agrume farmed from centuries in the backcountry of Savona. You can read more about them in my post. I was waiting for this moment since last year when I did the marmalade and I discovered how delicious it is, especially served with matured cheeses. I ask the farmer, Luca, to send me 4 kilos and in these days I’m preparing a lot of marmalade again. It will be the special hero on the cheese board I prepare during cooking classes! I have in my mind since a long time, and even more after I published my first tiny little book “Acqua di fiori d’Arancio amaro” (“bitter orange blossom water”, its bilingual Ita/Eng too), to work on a cookbook on Ligurian cuisine. In this period I’m collecting recipes, wondering how to structure it, and reading wonderful cookbooks written by other food writers to get inspired! In these days I’m reading “The bread and the Knife“, recently published but already a best seller. Next must have, already purchased and waiting form me on the bedside table is “Home cooking“. This recipe is near identical to my genovese grandmother we still make them every Christmas she is not around anymore and although she left her recipe for ravioli she did not for her sauce …I’m trying urs as its very close to what we have come up with thanks for sharing! Monica, I’m so happy to hear that! Hope you will enjoy the sauce, its the traditional one, so likely the one of your granny!